OPPO, a global smartphone brand, has opened its second regional hub within the UAE and will make Dubai its new center for operations in the Middle East and Africa (MEA) region. This is the brand's latest move in the region after announcing its plan of launching the R17 Series in Saudi Arabia earlier this month which will also be the first time OPPO launches its mid to high end R series in the region. The opening is part of OPPO's global growth strategy and recognizes Dubai's unique position as a regional nexus for business and technology innovation. The new hub will be OPPO's base for Middle East's regional sales, distribution and marketing operations, as well as being a point from which OPPO will look to deepen technology partnerships with other private and public-sector entities. The hub will also oversee OPPO's continued expansion in the Middle East with OPPO already evaluating a potential entry into markets like Saudi Arabia in 2019. Andy Shi, President of OPPO Middle East and Africa, commented, "With youth in its DNA, OPPO is dedicated to creating products that integrate technology and artistry, and give users a wonderful experience in their digital lives. The Gulf region is a particularly exciting market for us given the large youth population, the high level of mobile connectivity, and the public's enthusiasm for new technology experiences." "The UAE's combination of excellent infrastructure, open economic policies, and a strong talent pool make it an ideal hub from which to expand OPPO's business in the Gulf," added Shi. "In particular, Dubai is a vibrant multicultural city from which we can showcase the OPPO brand and better communicate with consumers from across the region and around the globe." The company recently announced that it would raise its global R&D investments to around $1.43 billion in 2019, a 150% year-on-year increase. This will allow OPPO to further explore areas of 5G, artificial intelligence (AI) and smart devices, which are recognized as key priorities in developing the UAE's technology infrastructure. In 2015, OPPO entered the Egyptian market. In 2016, OPPO set up its Middle East & Africa Sales Center in Cairo. The markets OPPO has entered in Middle East and Africa include: Egypt, Algeria, Morocco, the UAE, Qatar, Oman, Kenya and Nigeria. 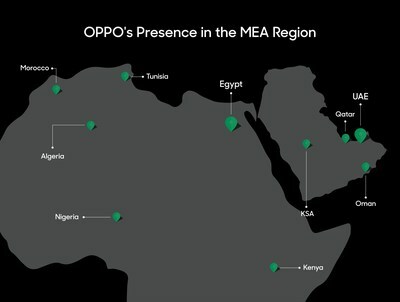 And OPPO MEA has launched in two new markets-- Tunisia and Nigeria. Also, OPPO MEA has prepared for entering the smartphone market of Saudi for over 6 months since June 2018.